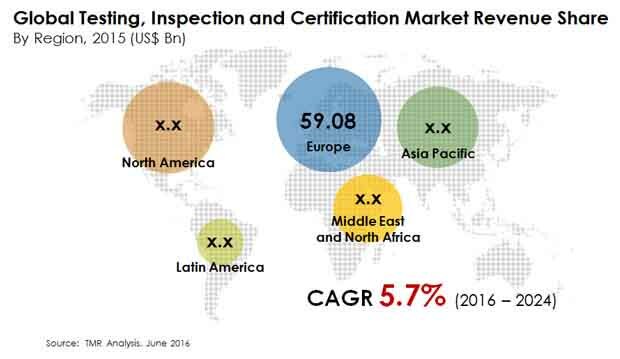 The global testing, inspection, and certification (TIC) market could embrace a fragmented nature because of a telling number of players sustaining their presence in the industry through key strategies. In 2016, ASTM International cashed in on a research and development strategy with the adoption of a new standard, i.e. F3127. This enabled the company to prove dominance on the part of effective and safe cleaning of medical devices. Acquisition and service development are expected to be the other action plans adopted by leading firms to make the cut in the industry despite the fragmented nature of the market. SGS Group held a 10.4% larger share in 2015. The world TIC market is predicted to earn a herculean revenue of US$285.34 bn by the end of the forecast period 2016–2024, according to the analysts at Transparency Market Research (TMR). This revenue growth could be registered on the back of a 5.7% CAGR. In 2015, the global market held a valuation of US$178.65 bn. The oil and gas sphere is anticipated to set a benchmark for other applications by accounting for a 35.04% share in 2024. The Middle East and Africa region is forecasted to secure a lion’s share of US$26.01 bn in the oil and gas segment by 2024. The global voluntary and mandatory TIC procedures are projected to be employed at a drastic rate with the augment in international trade between developing economies due to globalization. The exercised certification and inspection services have had a direct impact with the surge in the proportion of traded goods. The transportation, oil and gas, and energy sectors are heavily involved in outsourcing TIC responsibilities to focus on their core business and avoid high in-house laboratory costs owing to stringent regulatory requirements. This is prophesied to lay a good foundation for growth in the world TIC market. The need for adherence to stricter regulations pertaining to environment, quality, and safety and taxing environmental standards related to storage, discharge, disposal, and emission is envisaged to swell the demand in the global TIC market. Vendors in the international TIC market could suffer from the restraint of adhering to different international standards of different countries. Regulations and standards could also differ from product to product and service to service. This is envisioned to increase the expenses of manufacturers and affect their decision making on the negative side. The emerging markets are prognosticated to create lucrative opportunities for manufacturers as a result of extensive export activities observed between developing and developed economies. Moreover, western economies are looking to take charge of the entire value chain, which has increased the need for maintaining compliance with western standards. This is also expected to stimulate the demand for TIC services. Consumers in the BRIC countries have become extremely choosy about their food and health. In this regard, there is more preference expected for certified products. By the same token, the increase in disposable income and economic improvement is foreseen to set the tone for the TIC market with the rise in demand for consumer goods, energy, and water. More opportunities could arise from the development of new TIC techniques for power grid management and reliability and safety validation of the systems. Players such as AsureQuality Ltd., ALS Ltd., Dekra SE, Intertek Group PLC, and Bureau Veritas SA are foretold to be the toughest in the global TIC market.